Beading needles are very fine with a narrow eye to enable them fit through the centre of beads and sequins along with a long shaft to thread and hold a number of beads at a time. 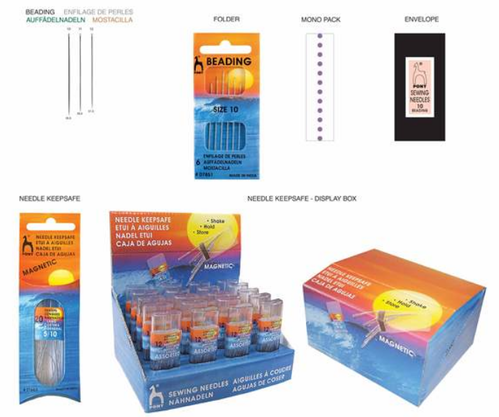 The corporate headquarters and manufacturing facilities of Needle Industries (India) Private Limited are located in the Nilgiri Mountains of South India.Our product range includes, Hand Sewing Needles, Knitting Pins and accessories, Snap Fasteners, Hooks & Eyes and a complete range of pins. Our products and the Pony brand are known the world over for their excellent quality, durability and value.